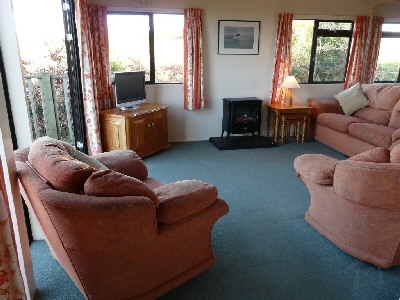 LOUNGE - view of Lligwy beach and sea through large glass windows and French doors leading onto a large decked area. Coal and log effect gas fire with real flames. Colour television and video. KITCHEN - fully equipped including built-in gas oven, grill and hob, fridge/freezer, microwave and washing machine. 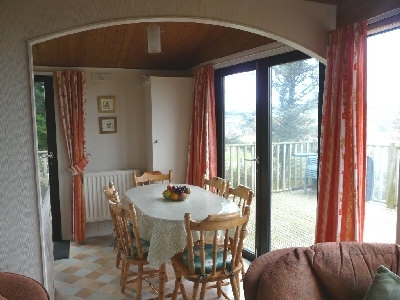 DINING AREA - view of Lligwy beach and sea through large glass windows and French doors leading onto large decked area. Seating for six people. Within a few minutes walk of Seaview Lodge are two coastal public footpaths going in opposite directions from the beach. One follows the cliff edge to the village of Moelfre, the other along cliffs, coves and beaches to Dulas Estuary where it turns inland up over a hill ending at the Pilot Boat Inn. Also, within a ten minute walk is an Ancient Monument site; the ancient village known as Din Lligwy Hut Group, where there is also a Neolithic and early Bronze Age burial chamber and a derelict 16th Century church. Gas central heating (with individual controls on each radiator) with radiators in all the rooms. Electricity, gas and bed linen are included in the price of the holiday.